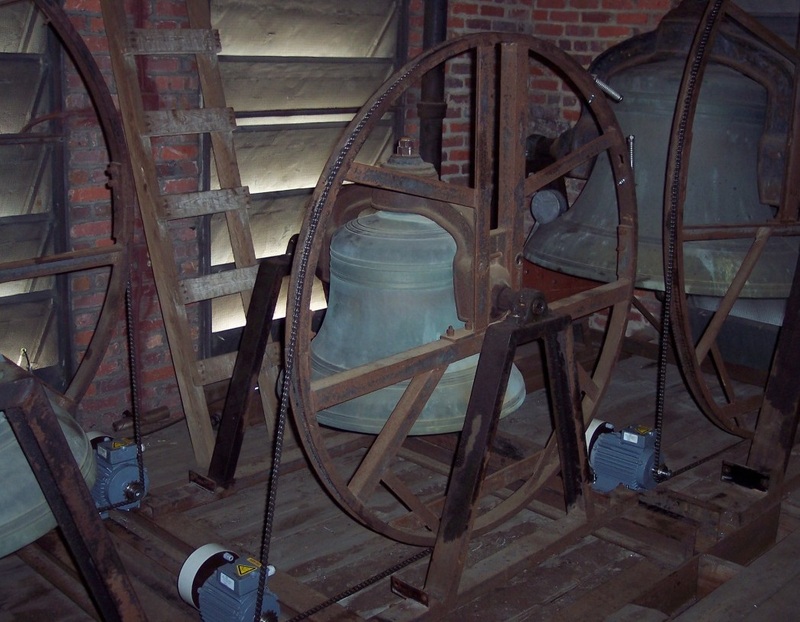 Three updated and electrified tower bells, various sizes and voice. Historic buildings originally lacked most building mechanicals familiar today, but they were often equipped with one mechanical system that performed many modern functions. In their day, tower bells broadcast information about public safety, special events, the time and even played music. While these functions have been superseded by successive waves of technology, the bells themselves remain, often neglected. Here are typical conditions that Carl Rickershauser, of Coastal Clock and Chime in Cinnaminson, NJ found at St. Paul’s Church in Winston Salem, NC. A loose bell to yoke connection was easily diagnosed as it will produce an alarming shock that can be felt far down the structure when the bell is swung. This “chucking” or working of the connection is dangerous and the bell should not be rung until the fasteners are tightened or replaced. Difficult action caused by wearing ropes is sometimes a sign of loose, misaligned or damaged pulley blocks or wheel. These elements must be restored and the action adjusted or the bell motion may be forced or uncontrolled with potentially dangerous consequences. The bell may also require rebalancing so that it hangs upright and swings evenly. Even with properly adjusted and well maintained equipment, bell ringing is a species of heavy equipment operation and should only be safely entrusted to fit, well trained and responsible persons. Electrifying a bell, as was done at St. Paul’s, ensures full time safe operation. Developments in ringing systems, including computer circuitry, have expanded the range and convenience of ringing options. The easier and safer historic bells can be made to use, the more their voices will be heard. Carl Rickershauser is a Member of the Guild of Building Artisans. List of Bell Tower Specialists. 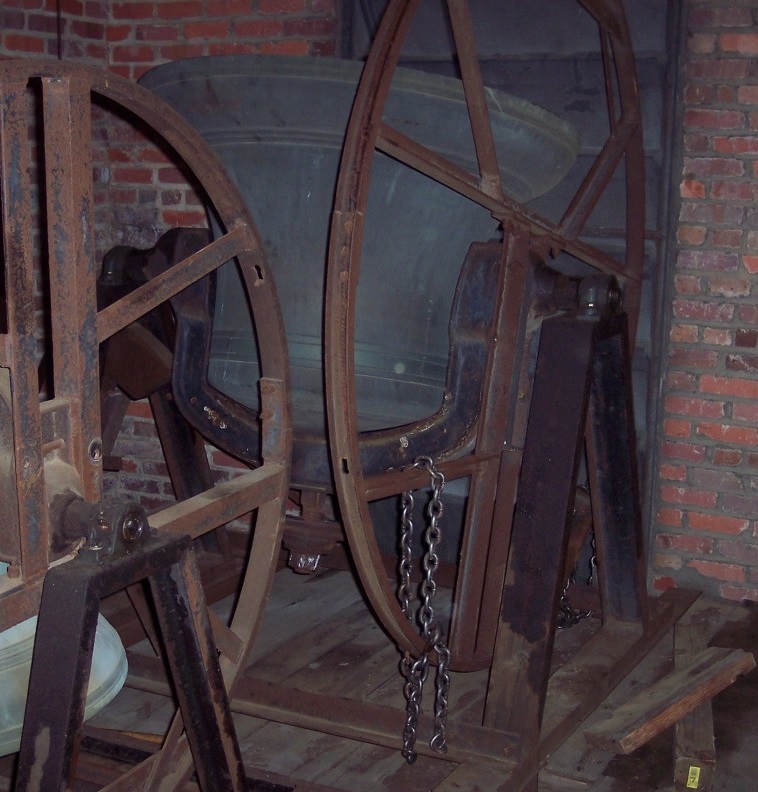 Large bell turned upside down for yoke adjustment. This entry was posted in Steeples and Towers and tagged Church Restoration, New Jersey, North Carolina, Tower Bells. Bookmark the permalink.